Two reports released in December continue to document the positive effects of TMA's 2003 medical liability reforms. They're working. The Centers for Medicare & Medicaid Services (CMS) may soon ask you what you think of the job that TrailBlazer Health Enterprises, the Texas Medicare carrier, is doing. March 16 is the new deadline for physicians to apply for financial help to rebuild their practices damaged or destroyed by Hurricane Ike. Make sure you're prepared to participate in the legislative process next year by attending the TMA Winter Conference Jan 30-31 at the Hyatt Regency Hotel in Austin. Join physician colleagues from across the state for TMA’s three annual opportunity-packed conferences that will equip you to be more successful in your medical practice, advance the profession of medicine, and better serve your patients. UnitedHealthcare is expanding its support of e-prescribing from small pilots in three states to include Texas and several other states. The Texas phase will begin in the Austin, San Antonio, and Waco markets. Irvin E. Zeitler, Jr., DO, of San Angelo, is the new president of the Texas Medical Board (TMB). Gov. Rick Perry appointed him for a term to expire at the governor's pleasure. You have until Dec. 31 to decide if you want to change your Medicare participation status from participating to non-participating or vice versa for 2009. As part of the settlement in physicians’ national class action lawsuit against numerous Blue Cross and Blue Shield plans, physicians may submit billing disputes to a new external review board. Take a look back over the last 12 months. Was staff turnover high? Did your overhead increase? Was cash flow down? Whatever your situation, resolve now to make 2009 better. The American Medical Association will host a webinar on the Centers for Medicare and Medicaid Services (CMS) 2009 Physician Quality Reporting Initiative (PQRI) from noon to 1:30 pm CST on Wednesday, Dec. 17. The Texas Legislature will be in full swing come January, and you won’t want to miss any of the action at TMA’s 2009 Winter Conference in Austin Jan. 30-31. 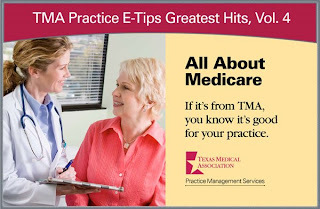 TMA’s Web site experiences nearly 320,000 visitor sessions each month. With this kind of activity, can you afford not to advertise in TMA’s online classifieds? Aetna is offering free online cross-cultural communication training for physicians, nurses, and health care professionals who care for Aetna members. UnitedHealthcare implemented a new medical policy for Single Photon Emission Computed Tomography Myocardial Perfusion Imaging (SPECT MPI) on Dec. 1.